Disclaimer: I did not pay for my meal, Meatball and Wine Bar hosted two media breakfast sittings. The opinions reported below are based solely on my thoughts at the time of my visit. It’s never too early to have a mouthful of balls. If anything, it helps kick-start the day. The Meatball and Wine Bar in Flinders Lane has been fostering Melbourne’s love affair with meatballs, complete with a phallic sense of humour, since they opened in the second half of last year. 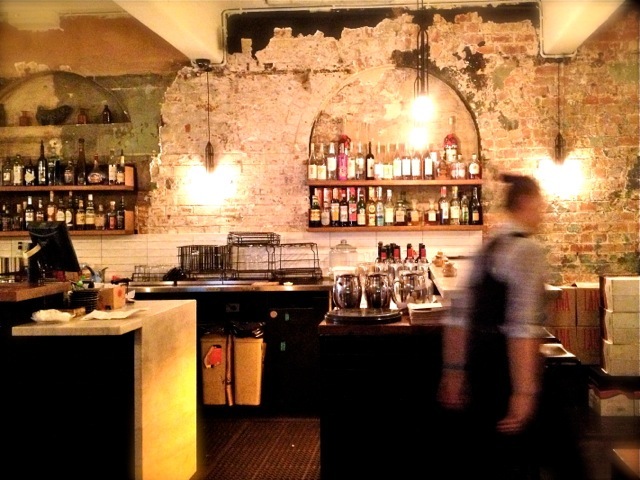 Its late night bar menu featuring charcuterie and homemade jerky won me over in 2012 when I visited on my birthday, where I also fell in love with the ‘whoopie mac’ dessert. The Meatball and Wine Bar has done its salutes to the sun and turned all ‘morning glory’ on the CBD, inviting city folk in for breakfast before they go into work. 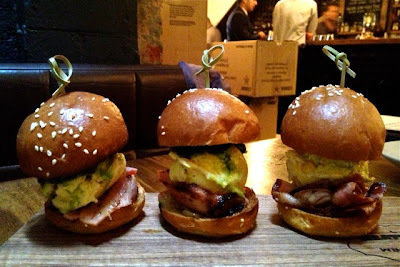 The breakfast menu features brekkie sliders, baked eggs, balls and other delights. We started with hand-pressed orange and grapefruit juices, before moving onto Dukes coffee while we examined the menu. I was invited to try breakfast at The Meatball and Wine Bar with some other bloggers. 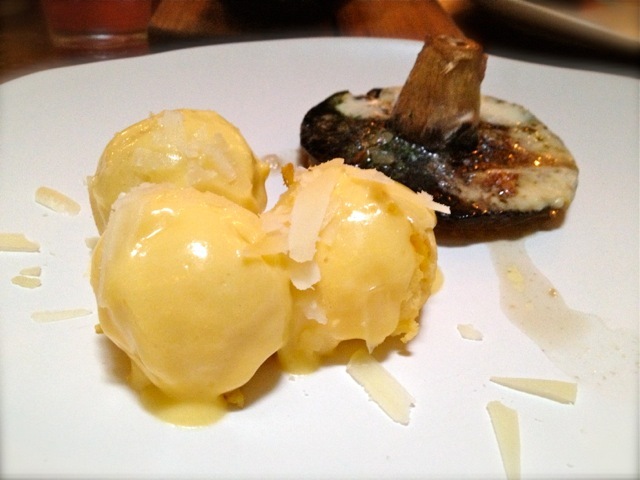 Three of us shared the creamy egg balls with Hollandaise and a side of mushroom with melted taleggio; herbed green egg balls with red sauce and avocado, and the egg with charred corn and aged cheddar balls in sliders with green pesto sauce. I found the creamy egg balls a bit spongy and sickly with the Hollandaise, but the green egg balls with the light tomato passata was a more satisfying and healthy option. Obviously, the sugary slider buns smeared in green pesto sauce with the charred corn and cheddar egg balls was the best of the breakfast dishes. Between us, we conquered all three breakfast ball varieties, as well as the three sauces (with colours that mirror the Italian flag). Other sides include artisan smoked salmon, smoky grilled bacon and a bowl of cooked spinach mysteriously dubbed ‘something green’ on the menu. 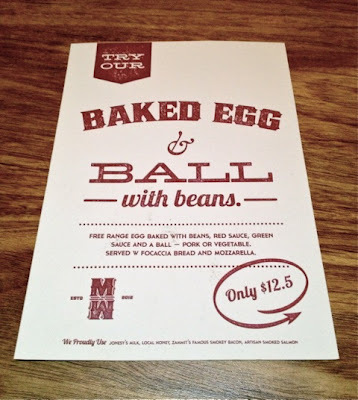 Also available for breakfast at The Meatball and Wine Bar is their take on baked eggs, a hearty combination of egg with red and green sauce and a pork or veggie ball, served with focaccia and mozzarella. I was also tempted by the warm panettone and muscatel Balls, rolled in honey and served with organic vanilla bean yogurt, but I was feeling particularly savoury that morning (shock horror). 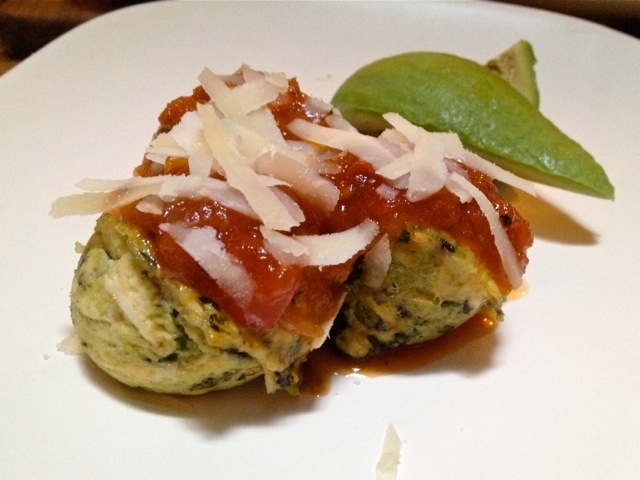 For those with an aversion to the spherical, the menu also features corn cakes with spinach and ricotta, avocado, heirloom tomatoes, torn mozzarella, basil and avocado on quinoa bread; muesli; and toast and pastries. 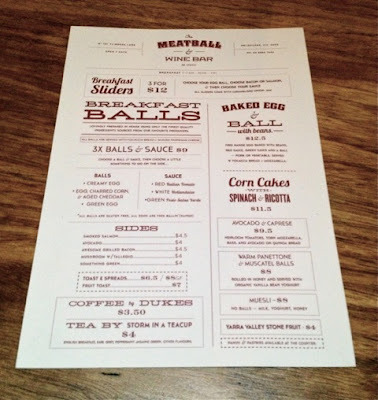 The Meatball and Wine Bar is a handy spot for a quick pre-work breakfast or early work meeting. If nothing else, it’s worth noting that you won’t have to wait an hour plus for a seat like you do in the evening. Ugh, I was trying to convince the bf to come here with me for dinner over the weekend but he wanted to go to Mess Hall instead. I love Mess Hall but we had a terrible time there that night (food was only ok this time and the service was bad) - serves him right for not listening to me! Can't wait to finally try Meatball and Wine Bar. Haha! Love your take on food karma, Libby! Definitely recommend it as a great date place. Not too fancy but still has the dimly lit romantic feel. Hi very thanks to the person who made this post, this was very informative for me. Great website...and cool article man...thanx for the great post...keep on posting such articles... Resources like the one you mentioned here will be very useful to me! I will post a link to this page on my blog. I am sure my visitors will find that very useful. I cannot like the Bun meal. but i like the meal with Meatball and Red wine so tasty.I like the this verity of bar which a man remain alone and enjoy the Bar manu.Next time i should be come your hotel.